Even though my beauty stash has plenty of corals, peach colors every time I see a new polish, lipstick, gloss- I need to add it to my collection! While at Dollar Tree I spotted some beautiful summer nail polishes. I only picked up two (it took restraint-I'll admit) but the one I'm loving so much is LA Colors color craze in Magnetic Force. In the bottle it has a tangerine look and when the bottle is moved a bit, a bit of gold peeks out-on the nails it's actually not very visible. Applying this was easy and I had to do zero clean up around the edges! As much as I love getting my nails done- money wise that's not really possible for me, so having easy to apply polishes is a must for me! These next two have been hard not to fall in love with as they are both very popular among the beauty online community and are beautiful summer colors! MAC Costa Chic and Vegas Volt. Both were my last back2mac choices- quite happy with my choices for both! Costa Chic is a frost and thought it would make me look a bit clownish on my NC42 complexion- Strange Potion Lipglass to the rescue. When applied over Costa Chic it tends to tone down the frost and make it a gorgeous combo. Wasn't able to swatch Strange Potion as it is currently MIA- hopefully not for long! Revlon Rendezvous also makes the cut as it's perfect coral stain that is buildable. Again I have to say that I adore the mint smell of these lip balm stains! 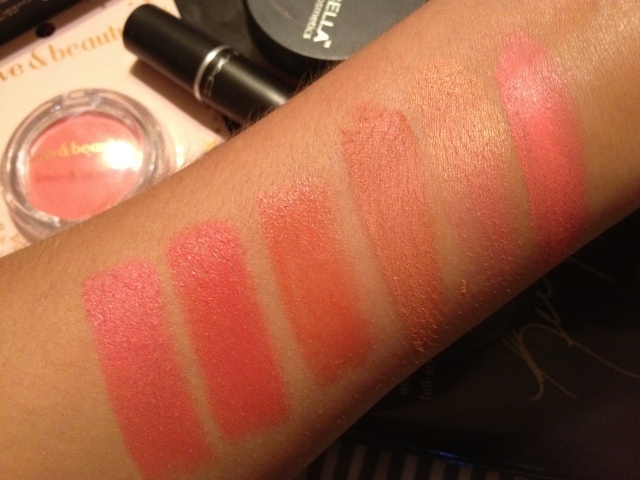 Blush- I love blush and tend to have a heavy hand and apply a bit too much but I can't help it! I've gotten better as I'm trying the less-is-more approach for summer. Nevertheless my current go-to corals are MAC Springsheen. Springsheen has a golden touch to it which I think works with just a touch. 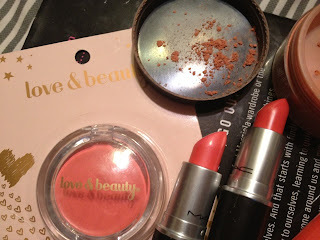 a bit darker but still lovely I have a Micabella mineral blush in Terra Cotta- it took me a bit to get the hang of this as I was never to keen on the idea of mineral products. Thought they'd be messy and flying everywhere! With a good brush and a light hand, they are becoming good friends of mine. 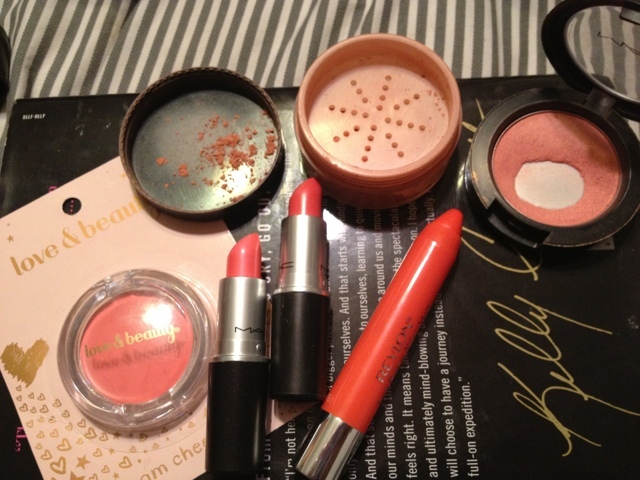 Lastly my love&beauty (Forever 21 brand) cream cheek blush in what else (?) coral. This is my second pot- wanted to have an extra on hand and applies very easy with my fingers or my Real Techniques stippling brush (love this brush!). Wow- I sound like a national coral for everyone spokesperson! Enable me- us there a coral product I should check out? I'm the same. 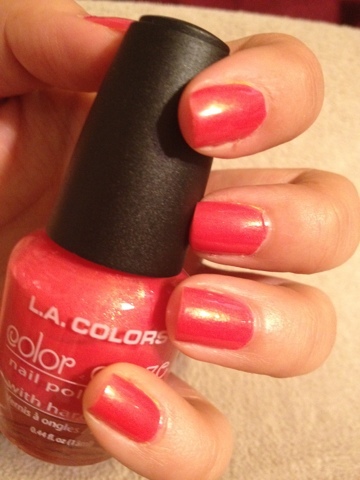 I'm mad for corals and they're so good for summer. Costa Chic was my fave lippy for holiday (alond with Impassioned). I fancy the look of Vegas Volt. I think you'd love Vegas Volt! 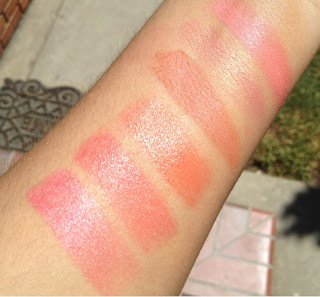 The MAC lipsticks look great- I love a nice pinky coral! I love a dark lip, but these coral-pinky lippies seem to go with everything!